If we are all lucky enough to live long, healthy lives, we still have something unpleasant to anticipate. Not merely death and taxes, but the ravages of extreme old age. I’ve been thinking of “extreme old age” lately, because my birthday was December 3rd. I’m now 47 years old, and getting older every damn minute. Extreme Old Age has been treated, by cult-TV as, literally, a disease, many times over the last several decades. Not always…but often. Consider Star Trek’s (1966-1969) “The Deadly Years,” in which Captain Kirk (William Shatner), Mr. Spock (Leonard Nimoy), Bones McCoy (DeForest Kelley) and Mr. Scott (James Doohan) are exposed to a strange form of radiation at Gamma Hydra II. That radiations causes them to age at a highly advanced rate, and their youth disappears before our very eyes. In “And the Children Shall Lead,” a third season Trek, Lt. Uhura is forced to confront her worst fear: extreme old age. 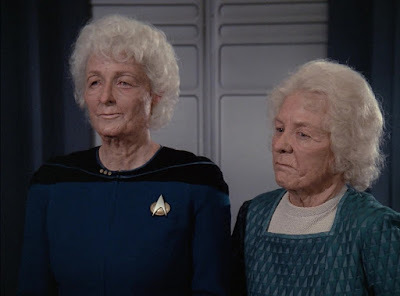 Star Trek: The Next Generation (1987-1994) went where the original series had gone before with a similar episode during its second season, called “Unnatural Selection.” There, Dr. Kate Pulaski (Diana Muldaur) was exposed to a virus which super-aged her. 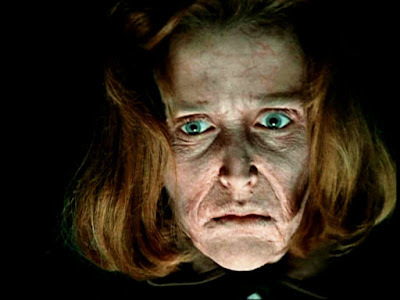 Even The X-Files (1993-2002) treated old age as a malady which could be cured in the second season tale, “Dod Kalm.” There, Scully (Gillian Anderson) and Mulder (David Duchovny) boarded a ship at sea, where they were exposed to a disease that mimicked the symptoms of accelerated aging. Other series have also handled extreme old age, though not as a disease that can be contracted and, ultimately, reversed by medical means. In Space: 1999 (1975-1977), one episode, “Black Sun,” saw Commander John Koenig (Martin Landau) and Professor Victor Bergman (Barry Morse) aging rapidly into old men as they passed through the event horizon of a black hole. The aging was later reversed, upon exiting from the black hole. 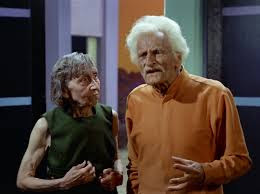 A Year Two episode of the same series, “The Exiles,” saw an alien, Cantar (Peter Duncan) age and die of extreme old age in mere minutes, after Dr. Russell (Barbara Bain) rips a protective layer surrounding his flesh. Horror TV series have dealt with extreme old age too. 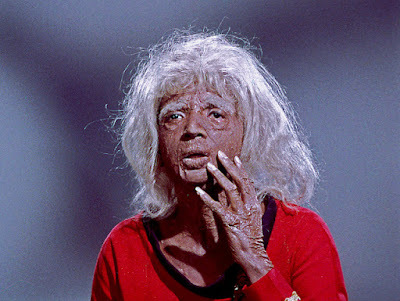 Thriller’s (1960-1962)) “Pigeons from Hell” features a terrifying crone. 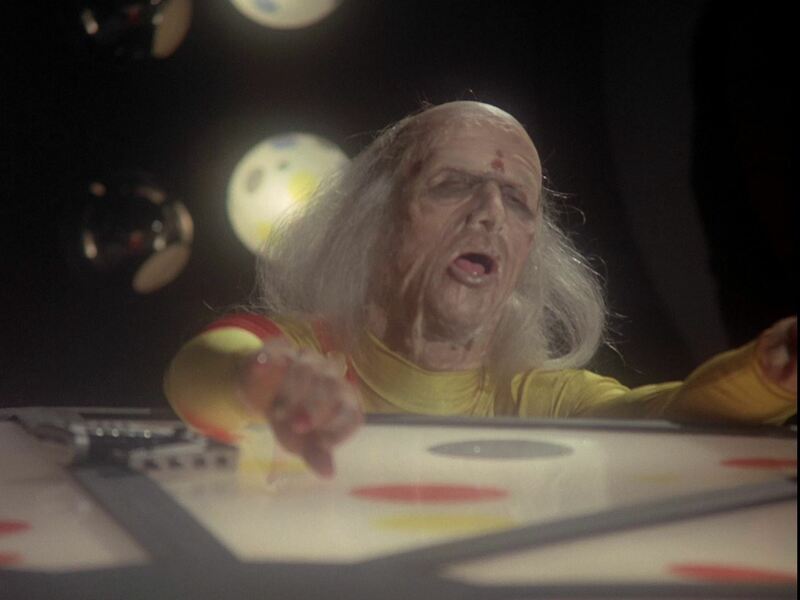 And Tales from the Darkside’s (1983-1988) “A Case of the Stubborns” involves a grandpa who is so old that he has actually died, and doesn’t realize it. The Twilight Zone’s (1959-1964) “Long Live Walter Jameson” involves an immortal man, the aforementioned Jameson (Kevin McCarthy) who finally super-ages -- in seconds -- and dies.